Acentury or so ago, the number of cars on Earth numbered in the thousands. Today, there are something like a billion cars—roughly one for every seven people on the planet. Think of Earth as a giant gas station with only a limited supply of fuel and you'll realize quite quickly that we have a problem. Many geologists think we're reaching a point they call "peak oil" and, in the next few decades, supplies of gasoline (and everything else made from petroleum) will start to dwindle. If that happens, where will all our cars get their fuel from? The short-term fix is to get better fuel efficiency from existing cars. In the longer term, the solution may be to switch vehicles over from gasoline engines and diesel to electric fuel cells, which are a bit like batteries powered by hydrogen gas that never run flat. Silent and pollution free, they're among the cleanest and greenest power sources yet developed. Are they all they're promised to be? Let's take a closer look at how they work! Photo: Ford Motor Company's hydrogen fuel cell demonstration car (a modified Ford Focus). Photo by courtesy of NASA Kennedy Space Center (NASA-KSC). Photo: Under the hood of Ford's hydrogen fuel cell car. Photo by courtesy of Ford Motor Company and US Department of Energy/National Renewable Energy Laboratory. There are really just two ways to power a modern car. Most cars on the road today use an internal-combustion engine to burn petroleum-based fuel, generate heat, and push pistons up and down to drive the transmission and the wheels. Electric cars work an entirely different way. Instead of an engine, they rely on batteries that feed electric power to electric motors that drive the wheels directly. Hybrid cars have both internal-combustion engines and electric motors and switch between the two to suit the driving conditions. Fuel cells are a bit like a cross between an internal-combustion engine and battery power. Like an internal-combustion engine, they make power by using fuel from a tank (though the fuel is pressurized hydrogen gas rather than gasoline or diesel). 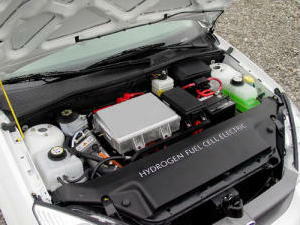 But, unlike an engine, a fuel cell doesn't burn the hydrogen. Instead, it's fused chemically with oxygen from the air to make water. In the process, which resembles what happens in a battery, electricity is released and this is used to power an electric motor (or motors) that can drive a vehicle. The only waste product is the water—and that's so pure you can drink it! Think of fuel cells as batteries that never run flat. Instead of slowly depleting the chemicals inside them (as normal batteries do), fuel cells run on a steady supply of hydrogen and keep making electricity for as long as there's fuel in the tank. What happens in a fuel cell is called an electrochemical reaction. It's a chemical reaction, because it involves two chemicals joining together, but it's an electrical reaction too because electricity is produced as the reaction runs its course. Hydrogen gas from the tank (shown here as big brown blobs) feeds down a pipe to the positive terminal. Hydrogen is flammable and explosive, so the tank has to be extremely strong. Oxygen from the air (big turquoise blobs) comes down a second pipe to the negative terminal. The positive terminal (red) is made of platinum, a precious metal catalyst designed to speed up the chemistry that happens in the fuel cell. When atoms of hydrogen gas reach the catalyst, they split up into hydrogen ions (protons) and electrons (small black blobs). In case you're confused: hydrogen ions are simply hydrogen atoms with their electrons removed. Since they have only one proton and one electron to start with, a hydrogen ion is the same thing as a proton. The protons, being positively charged, are attracted to the negative terminal (blue) and travel through the electrolyte (yellow) towards it. The electrolyte is a thin membrane made of a special polymer (plastic) film and only the protons can pass through it. The electrons, meanwhile, flow through the outer circuit. As they do so, they power the electric motor (orange and black) that drives the car's wheels. Eventually, they arrive at the negative terminal (blue) too. At the negative terminal, the protons and electrons recombine with oxygen from the air in a chemical reaction that produces water. The water is given off from the exhaust pipe as water vapor or steam. This type of fuel cell is called a PEM (different people say this stands for polymer exchange membrane or proton exchange membrane because it involves an exchange of protons across a polymer membrane). It'll keep running for as long as there are supplies of hydrogen and oxygen. Since there's always plenty of oxygen in the air, the only limiting factor is how much hydrogen there is in the tank. A single fuel cell produces only about as much electricity as a single dry-cell battery—nowhere near enough to power a laptop computer, let alone a car. That's why fuel cells designed for vehicles use stacks of fuel cells linked together in a series. The total electricity they produce is equal to the number of cells multiplied by the power each cell produces. Photo: Here's what a fuel cell actually looks like. 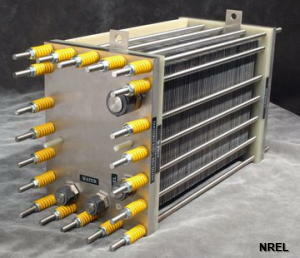 This is a typical proton exchange membrane (PEM) hydrogen fuel-cell that can produce 5 kilowatts (5000 watts) of power. Photo by Warren Gretz courtesy of US Department of Energy/National Renewable Energy Laboratory (DOE/NREL). Where will all the hydrogen come from? For the last 150 years or so, virtually every car has run on a liquid we rather confusingly call gas. But in the next 150 years, many people think cars will run on a real gas: hydrogen. In theory, running cars off hydrogen is a great idea: it's the simplest and most common chemical element and it makes up the vast majority (something like three quarters) of the entire matter in the Universe. Plenty for everyone, then! But there's a snag: poke about in the air around you and you won't find much hydrogen at all—only about one liter of hydrogen in every million liters of air. (In volume terms, that's the same as hunting down about two liters of water randomly mixed up in every Olympic swimming pool full). So where will all the vast clouds of hydrogen come from to run our global car fleet? We'll need to make it ourselves from water, the magic substance that covers 70 percent of Earth's surface, is made partly from hydrogen. Split good old H2O into its parts and you get H2 (hydrogen) and O2 (oxygen). How do you do it? With an electrolyzer! An electrolyzer is a piece of electrochemical apparatus (something that uses electricity and chemistry at the same time) designed to perform electrolysis: splitting a solution into the atoms from which it's made by passing electricity through it. Electrolysis was pioneered in the 18th century by British chemist Sir Humphry Davy (1778–1829), who used a primitive battery called a Voltaic pile to discover a number of chemical elements including sodium and potassium. In an electrolyzer, you place a solution in a container and dip two terminals into it. You connect the terminals up to a battery or other power supply and pass electricity through the solution. Chemical reactions take place and the solution splits up into its atoms. 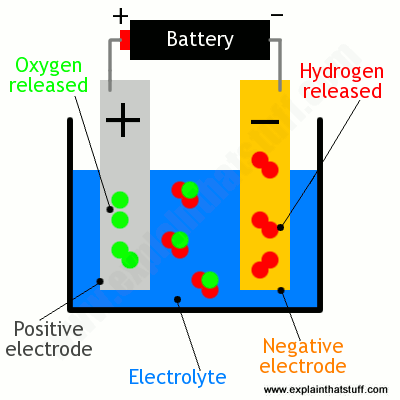 If the solution you use is pure water (H2O), you find it quickly splitting up into hydrogen gas (at the negative electrode) and oxygen gas (at the positive electrode). It's relatively easy to collect and store these gases for use in future. Photo: Demonstrating hydrogen power. Light (from the Sun) hits a solar cell (the blue rectangle on the left), making electricity. An electrolyzer uses this electrical energy to split water into oxygen and hydrogen (collected in the test tubes in the middle of the picture). The hydrogen is then fed into a fuel cell (metal box on the right), which produces electricity and lights a lamp (right). Photos by Warren Gretz courtesy of US Department of Energy/National Renewable Energy Laboratory (DOE/NREL). How does an electrolyzer work? A battery connects the positive terminal (sometimes called the anode) to the negative terminal (or cathode) through an electrolyte. In a simple laboratory experiment, the electrolyte could be pure water. In a real electrolyzer, performance is improved considerably by using a solid polymer membrane as the electrolyte, which allows ions to move through it. When the power is switched on, water (H2O—shown here as two red blobs joined to one green one) splits into positively charged hydrogen ions (hydrogen atoms missing electrons, shown in red) and negatively charged oxygen ions (oxygen atoms with extra electrons, shown in green). The positive hydrogen ions are attracted to the negative terminal and recombine in pairs to form hydrogen gas (H2). Likewise, the negative oxygen ions are drawn to the positive terminal and recombine in pairs there to form oxygen gas (O2). Why are fuel cells taking so long to catch on? Photo: It could be a while before hydrogen filling pumps like this become commonplace. Photo by courtesy of NASA Glenn Research Center. "For decades, hydrogen has been the Dracula of automotive fuels: Just when you think a stake has been driven through its zero-emissions heart, the technology rises from the grave." The New York Times, April 2015. People have been heralding fuel cells as the next big thing in power supplies since the 1960s, when the Apollo space rockets first demonstrated that the technology was practical. Four decades later, there are hardly any fuel-cell cars on our streets—for a variety of reasons. First, the world is geared up to producing gasoline engines by the million, so they're naturally much cheaper, better tested, and more reliable. You can buy an ordinary car for a few thousand dollars/pounds but, until recently, a fuel-cell car would have set you back hundreds of thousands. (Toyota's "relatively affordable" Mirai finally became widely available in 2016 at a cost of just under US$60,000, twice the price of its hybrid Prius.) Cost isn't the only problem. There's also a massive oil-based economy to support gasoline engines: there are garages everywhere that can service gasoline-powered cars and filling stations all over the place to supply them with fuel. By contrast, hardly anyone knows anything about fuel-cell cars and there are virtually no filling stations supplying pressurized hydrogen. The "hydrogen economy" is a far-off dream. It's easy to see how a world full of hydrogen cars might work. We'd have lots of electrolyzer factories all over the place making hydrogen gas from water. Now gases take up a vast amount more space than liquids or solids, so we'd need to turn the hydrogen gas into liquid hydrogen, making it easier to transport and store, by compressing it to a high pressure. 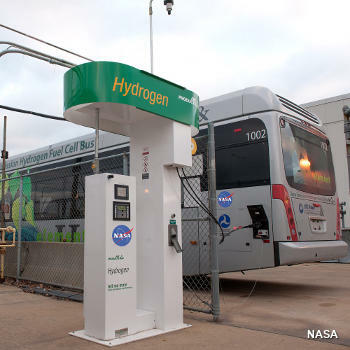 Then we'd transport the hydrogen to gas stations ("hydrogen stations"?) where people could pump it into their cars, which would be powered by fuel cells instead of conventional gasoline engines. But do you see the problem? Producing hydrogen by electrolysis uses energy—and quite a lot of it: we have to use electricity to split up water. If we use typical solar cells to provide that electricity, they might be about 10 percent efficient, while an electrolyzer might be 75 percent efficient, giving a miserable overall efficiency of just 7.5 percent. That's quite a poor start—and it's only the start! We also use energy transporting hydrogen and compressing it (turning hydrogen gas into a liquid) so cars can carry enough of it in their tanks to go anywhere. That's a real problem because the energy density of hydrogen (the amount of energy it carries per unit of its volume or mass) is only about a fifth that of gasoline. In other words, you need five times more to go as far (assuming your hydrogen car is heavy as your gasoline one, which may not be the case—because gasoline cars need heavy engines and transmissions). Another problem is that hydrogen is difficult to store for long periods because its extremely tiny molecules easily leak out of most containers—and since hydrogen is flammable, leaks can cause horrific explosions. And then, of course, there are all the inefficiencies at the opposite end of the process, when a fuel-cell car turns hydrogen back into electricity to power the electric motors that drive its wheels. "...hydrogen is a hyped-up bandwagon... Hydrogen is not a miraculous source of energy; it's just an energy carrier, like a rechargeable battery. And it is a rather inefficient energy carrier, with a whole bunch of practical defects." Hydrogen is not, itself a fuel, but simply a way of transporting fuel made by some other process. So it's better to compare it to batteries (another way of packaging and transporting energy) than to gasoline (a genuine fuel). All told, today's hydrogen cars are considerably less efficient than the best electric cars running off batteries and often less efficient than ordinary gasoline or diesel engine vehicles! We could use solar cells to do the electrolysis of water "for free," but we could just as easily store the same energy in batteries and use those to power our cars instead. Fuel-cell cars sound promising, but if battery cars really are better, hydrogen may turn out to be an expensive distraction from the important business of switching the world from fossil fuels to renewable energy. All these problems, summed up, explain why battery-car advocates like Tesla's Elon Musk like to deride hydrogen cars as "fool-cell vehicles." But hydrogen also has its plus points! So why are people still pursuing fuel cells? Because, their supporters claim, they have numerous advantages over other electric-power technologies. Where charging up a battery-powered car can take anything from half an hour to a whole night, you can refuel a hydrogen car in just five minutes—as quickly as you can fill the gas tank of an ordinary car. The driving range of battery-powered cars has also been a point of contention. Current models now claim they can drive hundreds of kilometers or miles between charges, but not all of them manage that; it depends how much power you use for other things while driving; and range suffers as your battery gets older. Fuel-cell cars, by contrast, get much the same range as ordinary gas vehicles, although their performance does degrade as they age. Where battery technologies arguably work best in small cars, fuel-cells are equally good for larger vehicles and trucks. Some of these things may change with time as the two rival technologies—hydrogen fuel cells and rechargeable batteries—develop and mature. In summary, until oil becomes more expensive, motorists will have little or no incentive to switch to fuel-cell cars. Even then, there are rival technologies that may stop fuel-cell cars from ever catching on. We might stick with internal combustion engines, but power them with biofuels. Or it might turn out more efficient to build electric cars with onboard batteries that you charge up at home. Or perhaps a mass switch to hybrid cars, running gasoline engines and electric motors, will extend world oil supplies long enough for us to come up with an entirely new technology—maybe even nuclear-powered cars! No-one knows what the future holds, but one thing is certain: petroleum will be playing a much smaller part in it. The sooner we embrace alternatives—battery-electric cars, biofuels, fuel cells, or whatever—the better. 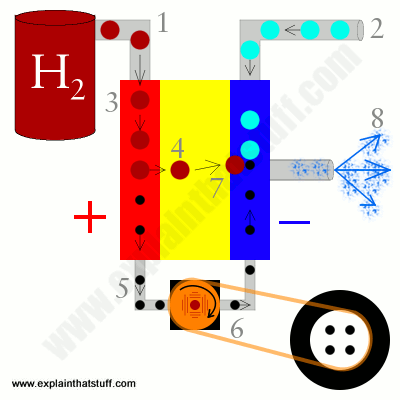 Hydrogen fuel cell: A Californian government website explaining the basics of fuel cells and their drawbacks. US Department of Energy: Fuel cell vehicles: A US government guide to the pros and cons of fuel-cell cars, including how they work, what's good and bad about them, and what kind of fuel economy you can expect. There are also test-drive videos of some current hydrogen fuel-cell cars. California Fuel Cell Partnership: Industry lobby promoting the use of fuel-cell technology. Lots of good background information on the site. Hydrogen economy: Wikipedia's comprehensive introduction to the pros, cons, and practical issues involved in using hydrogen as an alternative to fossil fuels. National Fuel Cell Research Center, UC Irvine: A good starting place for more detailed technical information. UPS to Deploy Fuel Cell/Battery Hybrids as Zero-Emission Delivery Trucks by Maria Gallucci, IEEE Spectrum, August 24, 2018. Fuell-cell delivery trucks are beginning to appear in eco-friendly California. Why the Automotive Future Will Be Dominated by Fuel Cells by Scott Samuelsen, IEEE Spectrum, December 5, 2016. A fuel cell enthusiast replies to critics with a passionate defence of the technology. Battle of zero emissions cars: hydrogen or electric? by Rupert Wingfield-Hayes. BBC News, 8 June 2015. Toyota, pioneer of hybrid cars, is now betting on hydrogen fuel cells as a way of increasing the range of electric vehicles. Hydrogen Fuel Cell Cars Return for Another Run by Lawrence Ulrich. The New York Times, April 16, 2015. Why car makers are once again turning to fuel cells. 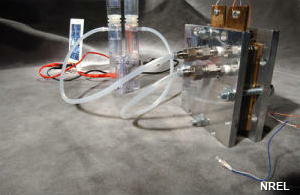 Portable Solar Power Plant Purifies Water, Makes Hydrogen by Willie Jones, IEEE Spectrum, October 20, 2010. A new disaster relief invention can purify water, generate electricity, and make hydrogen using an onboard electrolyzer and fuel cell. Apollo's fuel-cell power legacy by Richard Hollingham. BBC News, 16 July 2009. A brief overview of fuel cell cars and how they were inspired by space-rocket technology. Ceramic fuel cells by Duncan Clarke. The Guardian, 13 July 2009. How fuel cells can be used to make home electricity. Harnessing the Sun When It Doesn't Shine by Jeremy Miller. The New York Times, May 27, 2009. Daniel Nocera of MIT explains how electrolyzers can be used to store output from solar cells as hydrogen, in a kind of "artificial photosynthesis." Toshiba develops tiny fuel cell: BBC News, 24 June 2004. Fuel cells can power small appliances, as well as cars. Fuel Cells and Hydrogen Production by Timothy E. Lipman and Adam Weber (eds). Springer, 2019. A summary of where fuel-cell research is today. Hydrogen and Fuel Cells: Emerging Technologies and Applications by Bent Sørensen and Giuseppe Spazzafumo. Academic Press, 2018. A wide-ranging, 522-page guide to fuel cells and their many uses. Better transport and Hydrogen cars—blimp your ride: Cambridge physics professor David MacKay didn't believe the future lay with hydrogen cars. His view was that hydrogen is "an inefficient energy carrier" (because it takes so much energy to make hydrogen fuel) with "a whole bunch of practical defects" (because hydrogen is very hard to store easily and transport safely). The Hydrogen Economy: Opportunities and Challenges by Michael Ball and Martin Wietschel. Cambridge University Press, 2009. Are hydrogen cars the way forward? What obstacles do we need to overcome first?. The Hydrogen Economy by Jeremy Rifkin. J.P. Tarcher/Penguin, 2003. A more general guide to a world filled with hydrogen-powered, fuel-cell cars. Ion Exchange Membranes: Fundamentals and Applications by Yoshinobu Tanaka. Elsevier, 2007. A detailed, graduate-level covering all aspects of ion-exchange membrane technology, including its applications to electrolyzers. Modeling and Control of Fuel Cells: Distributed Generation Applications by Mohammad Hashem Nehrir and Caisheng Wang. Wiley-IEEE, 2009. US Patent 7,241,950: Solar cell electrolysis of water to make hydrogen and oxygen by Qinbai Fan et al, Gas Technology Institute, July 10, 2007. 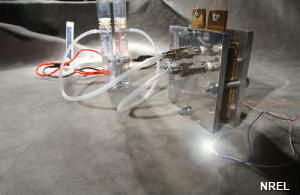 A cutting-edge, high-efficiency, solar-powered electrolyzer. US Patent 1,495,681: Electrolyzer for producing hydrogen and oxygen by Giacomo Fauser, May 27, 1924. A relatively simple hydrogen-oxygen electrolyzer from the early 20th century. [PDF] NASA Fuel Cell Activity: A great little activity for grades 5–12. 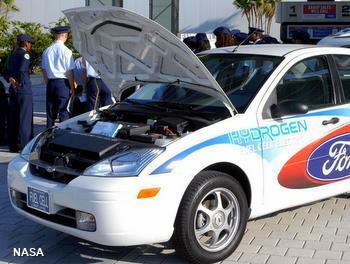 You get to build a fuel-cell car and power it with hydrogen made by splitting water.